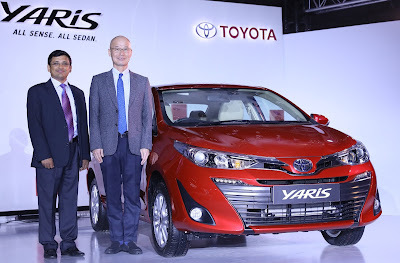 Toyota Kirloskar Motor has launched its versatile sedan –Yaris in India fueling excitement across country. 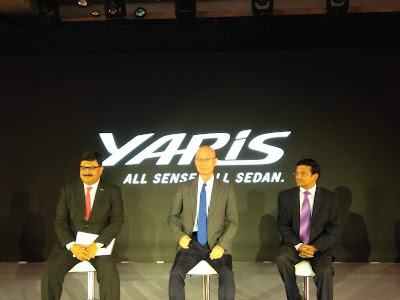 The sedan from world's leading automobile manufacturer, after rolling out Yaris in six countries globally have now localized the new model with extra safety, performance, comfort and also technology features specially suited for the rugged Indian roads. As one of the most anticipated cars of the year, Yaris boasts of advanced and emotional design, superior comfort, shining ride quality and quietness, dynamic efficiency and class-leading safety and technology. Customers can make their bookings at any of the authorized Toyota dealerships across the country with deliveries beginning from today. Toyota expects to deliver around 1000 plus Yaris to customers on first day of the delivery. Based on the 'one nation one selling price' strategy*, Yaris is now available across all dealerships (All India) at the same price at an attractive range of ₹ 8, 75,000/- to ₹ 14, 07,000/. *Prices will be same across the country at ex-showroom level, however the final on road price may vary based on local road tax and levies. Unveiled earlier this year at the India Auto Expo 2018, the new sedan comes in four grades and mated to a 7 speed CVT (Continuous Variable Transmission) or 6 speed MT (Manual Transmission) engine, offering effortless and dynamic driving. Commenting on the overwhelming response, N. Raja, Deputy Managing Director, Toyota Kirloskar Motor said, “We have received overwhelming response from customers across India. We are happy that in less than a month of announcing the price and opening the bookings, we have collected nearly two months equivalent of customer orders. In line with our customer first approach, we had started our production last month itself to cater to be able to match our supply to the customer demand and reduce the waiting period as much as possible. We look forward to shipping around 4000 plus Yaris across the country for customers by the end of May. We hope to service all these customer orders by the end of this month which will take us amongst the top 3 in sales in the petrol segment. In addition we have 60000 plus customer enquiries on Yaris which gives us the confidence that the customers are recognizing the value propositions that this product has to offer in the market. With the test drives already having begun across the country we are sure to see more conversions into customer orders taking place.